Off the Press, into the Kiln. Digital Tile Decoration. A ceramic is an inorganic or nonmetallic material that is usually clay-like in nature and heated to harden. Examples of ceramics include brick, tile, glass, and cement. Tile is a popular ceramic. Used in multiple environments, it is found on floors or walls—both indoors and outdoors. There is a growing demand from consumers for unique décor pieces that evoke natural-looking features in kitchens, bathrooms, and other areas. This means smaller runs and more customized products. Digital ceramic decoration addresses these requests. Today’s tile manufacturing facilities predominately feature digital printing devices. 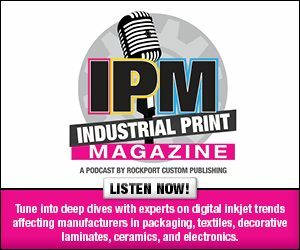 “Inkjet technology has proven to be a disruptive innovation in ceramic printing, saving printers substantial time and money,” says Angela Argit, marketing manager, Polymeric Group. Above: Tile digitally decorated using inks from Polymeric. Tile decoration is only one small part of the overall manufacturing process. Durst Phototechnik AG outlines how a ceramic tile comes to be in a series of successive stages. First raw materials are prepped, then a pressing or drying of the green body occurs. A green body is an object made up of weakly bound clay and other inorganic raw materials before it is fired. After the green body is formed, optional layers like glaze or englobe can be applied. Then, decoration occurs—either with digital printing equipment or using screen or flexographic printing. Next is the application of additional layers that serve purposes such as optical and haptic effects, wear resistance, or anti-slip properties. Once dried, the tile is fired in a kiln and then brought over to a finishing device for any number of processes—rectifying, polishing, or grinding. Finally, quality control, sorting, and packing are undertaken. Compare to Analog Compared to traditional ceramic decoration methods, inkjet is integral to automating and innovating the ceramic decoration process. Flexography and screenprinting were once common methods of decorating ceramic tile. “Traditional practices for decorating ceramics rely on screens used to add designs. The glass is usually hand applied after screening and tiles are then fired. Inkjet printing automates the process and changes on the fly. This enables more customizability of tiles as well as faster turnaround,” says Shaan Patel, business development manager, Arrow Systems, Inc. According to Norbert von Aufschnaiter, ceramics printing, Durst Phototechnik, the benefits of digital are found in both innovation and inventory savings. In regards to innovation, digital ceramic decoration technology allows for faster response to market needs, higher image quality and resolution, full edge-to-edge printing, unlimited design variation, and prototyping at reduced costs. Inventory savings include, “one color shade per tile design, print on demand production for minimized inventory, and the same ink set for all designs—a complete CMYK ink set for full-color space—and tile types found on floors and walls. Reduced ink management and storage costs as well as elimination of screen costs, storage, and setup time are other benefits,” shares von Aufschnaiter. “Since digital printing does not physically touch the tile—unlike in screenprinting—there is less breakage of the tiles, resulting in minimized waste product. This includes not only the tile itself, but also ink, glaze, and labor,” adds Argit. Only Ceramic While many of newest iterations of digital flatbeds enable printing to a number of substrates, including tile, dedicated digital ceramic printers are configured to only print on ceramic. Various hardware components are engineered to work specifically in response to the demands of printing on tile. “Using the same printheads as those found in large format commercial graphic printing systems, dedicated ceramic printers are installed in the glazing lines of ceramic factories subject to high dust and temperatures. The printers have to output onto hot tiles with temperatures around 45 to 60 degrees Celsius,” explains von Aufschnaiter. The digital printer is part of an overall multi-step process. “It can be automated as a full assembly line, or done offline using a plotter and spray booth. Generally, these types of printers are used as a full line that runs for three shifts per day—as it is quite expensive to reheat the kiln for shorter periods,” adds Patel. He says that the main components in the process are the printheads that lay down the inks and the coating station that follows the printing to glaze the tiles. After the print process, the tiles are fired in a kiln up to 1,200 degrees Celsius to create the finished product. Dedicated ceramic printers must be equipped with the correct consumables—specifically ink sets. The inks used for decorating tiles must withstand high heat once the printed tile is placed in the kiln. Ink containing inorganic pigments are ideal for this reason, however they come with challenges. Care must be taken in regards to sedimentation and avoiding printhead nozzle blockage. “Since the pigments used in ceramic inks have particle sizes close to one micron and a very high specific weight, they tend to sediment and appropriate measures must be integrated in such ceramic printers to prevent sedimentation,” explains von Aufschnaiter. Due to the instability of certain pigments when fired at high temperatures, standard CMYK cannot be used. “Instead mainly blue, brown, beige, pink, black, and green are utilized to cover the colors required for reproducing natural materials such as wood, stone, and marble,” adds von Aufschnaiter. A dedicated digital ceramic printer should interface with the other machines in a ceramic manufacturing line. Most models available today include the Scada software application for information sharing with factory installed systems. This offers real-time monitoring and bi-directional communication between multiple devices. Color management solutions are also important. For example, the new ColorGATE CMS Durst Edition is one of the first color management solutions designed and optimized specifically for the requirements and conditions in ceramics—small and non-linear color space of ceramic inks, flat and structured surfaces, and inconsistent process conditions. EFI created the Fiery proServer for Cretaprint. It offers precise on-screen editing, plus fast and low-cost paper prototyping using an inkjet proofing device. In addition, it accurately predicts final tile decoration results, eliminating the need for the traditional production prototyping process. Designs are converted consistently regardless of print conditions. Here, we include options for digital ceramic decoration, specifically dedicated digital printers that print to tile. Arrow Systems distributes KERAjet printers in the U.S. For example, one of its KERAjet digital inkjet printers offers up to seven colors of inorganic inks. It is equipped with water-based acrylic resin primer and the option for either UV-curable, water-based, or solvent coatings. Durst Phototechnik offers the Gamma XD digital decoration and effect printing device. It works in tandem with the Gamma DG, a true digital ceramics glazing and structure printing device. Running off the Gamma Cockpit job preparation, monitoring, and central decoration control, true ceramic color management is available. At Tecnargilla in 2019, EFI announced two fifth generation printers to its EFI Cretaprint portfolio—the C5 and D5 models. The devices are equipped with a new EFI e•D5 printhead designed to ensure better alignment and higher throughput speeds. System Ceramics was recently acquired by Coesia SpA. The company manufactures the Creadigit ceramic decoration system offering 400 dpi with up to 12 color bars. It can be outfitted with Fujifilm or Seiko printheads. TecnoFerrari offers the VIVAJET S-M digital decoration printer. Recent updates include a frame with up to eight bars, aspiration system for reduced cleaning cycles, and V7 software. Its software update includes a new user-friendly interface, integrated tone and intensity adjustment, and integrated diagnostics and tools for remote assistance. On a global scale, digital printing has fully integrated into tile decoration facilities. According to Patel, countries such as Brazil, China, India, Spain, and Turkey are home to many producers who only print using inkjet technology. “Over 10,000 single-pass ceramic printers are installed in ceramic tile factories, with the level of digital printing close to 100 percent,” shares von Aufschnaiter.